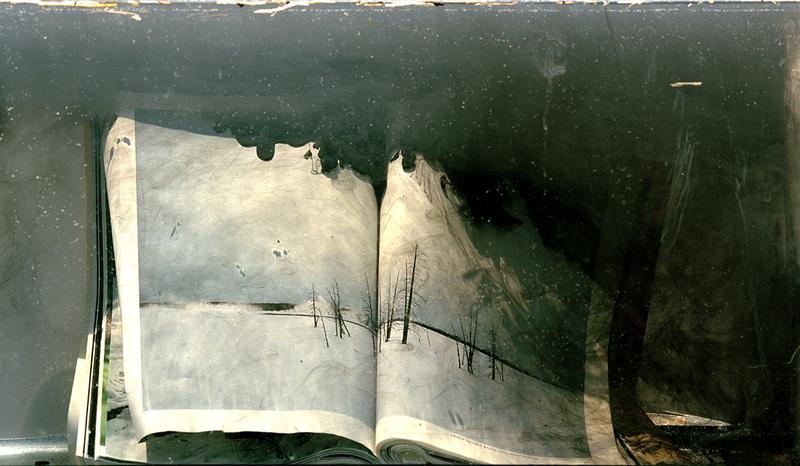 Kim Anno, photograph, National Geographic in fish tank, with ink and debris, 20” x 30” (2010). © 2010 by Kim Anno. Permission to reprint may be obtained only from the artist. This work appears on the Spring 2014 issue of Signs. In 2009 Kim Anno led a team of professors, students, and artists to create a national conference–Rising Tide, the Arts and Ecological Ethics–between the California College of the Arts and Stanford University. This experience transformed her own artistic practice. In 2011 she attended Cop 17 in Durban, while making a film with young people from KwaZulu-Natal. Her current work, “Water City, Berkeley,” is fourth in a continuing epic film/video work: Men and Women in Water Cities. In this photograph, Anno recognizes the complex history of national geographic magazine with its colonial past and environmental-action present and uses the sublime character of falling ink a tank of water to spoil it. Kim Anno is an interdisciplinary artist who works in painting, photography, and video installation and lives in Berkeley, California. She is also a professor and a member of the City of Berkeley’s civic arts commission, where democracy and a hunger for quality public art dovetail. Anno’s artwork images both darkness and light surrounding the coming disaster of climate change. Anno’s work is painterly and devoted to peculiarity in color in her paintings, photographs, and videos and films. Her current painting project is a remaking of the Grand Tour, darkly implicating her own reverence and desire for travel. For the past four years she has been making an epic expanded cinema work, Men and Women in Water Cities, working with actors, nonactors, and local citizens to imagine how to maintain intellectual life, aesthetics, and leisure time during the ravages of rising sea levels. She is also at work on a new collaboration with poet Anne Carson, an artists’ book titled Albertine’s Work Out, and screening her video work with live contemporary-classical composers and musicians.